Product #21270 | SKU SS2003 | 5.0 (based on 1 rating) Thanks for your rating! Note: A Kessler slider is required to use this system. The SS2005 Pan & Tilt Head for Second Shooter from Kessler Crane is a base pan & tilt head which enables you to add axes to your one-axis slider system and can be used with a variety of other Kessler tripod accessories. 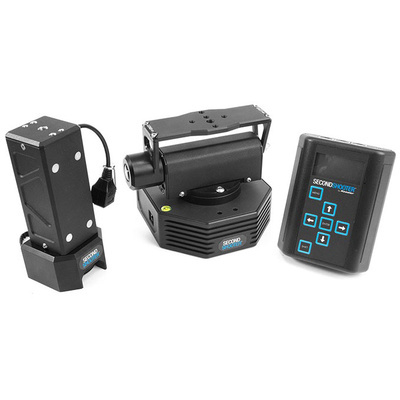 The head mounts via 3/8"-16 and 1/4"-20 holes on its bottom surface and is controlled by the Second Shooter Controller (sold separately) over the two included Cat5e cables. Its added so much production value to my video and also saved me so much time. With the second shooter I can quickly key frame the shot and I know it will be perfect. Out of the box its quick to put together.I didn't even look at the instructions, no need to. No tools required either. If you buy this, I recommend using it with the CineSlider, its sturdy and the rails are well protected. Also don't forget to buy the SliderBase --> Second Shooter adapter and also the Cineslider/Stealth Slider - motor adapter plate. Other wise you wont be able to mount your motor. Yes the kit cost a lot but its made to last 20 years. The build quality is immense. You get what you pay for. Also great service it was the first time buying from RM and was a great experience!! !